That Will Start Some "Neighborhood Buzz"! As you look for the perfect screen porch design, include architectural features that complement both your home and lifestyle. 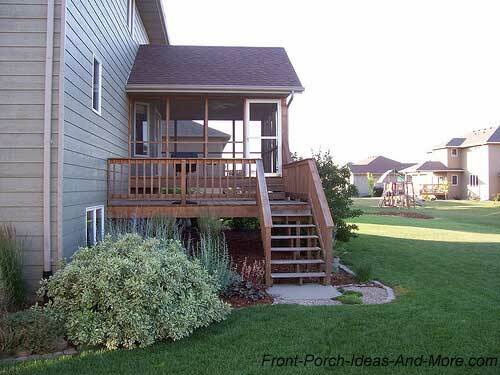 Not only do you want your screen porch to be inviting and unique, but also be easy to maintain, functional and safe. 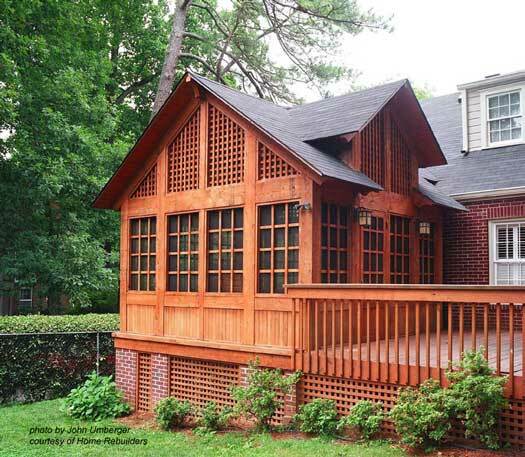 Your neighbors will be envious of the new screened porch you helped design! 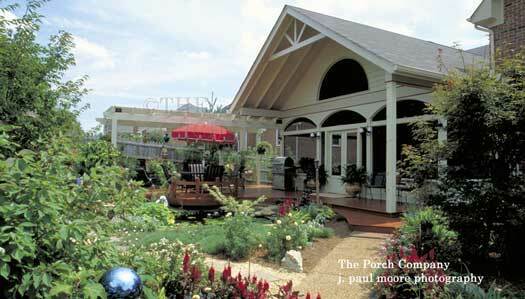 Once you know your porch's purpose and how large it should be, figuring out the exterior design is the next step. If constructing your screen porch from a kit, the exterior design is already decided unless you still need to build a roof or balustrade. Mary and I have gathered many screen porch design ideas here for you - and inspiration from which to design your perfect at-home getaway. 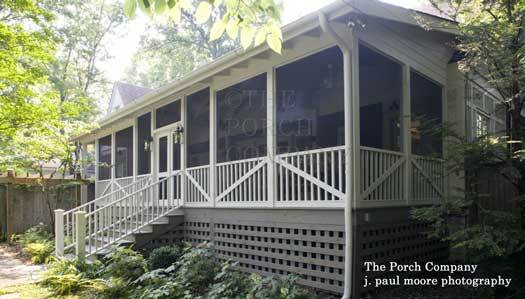 We've loaded this section with lots of custom screen porch design photos along with detailed planning information. Let the planning begin. 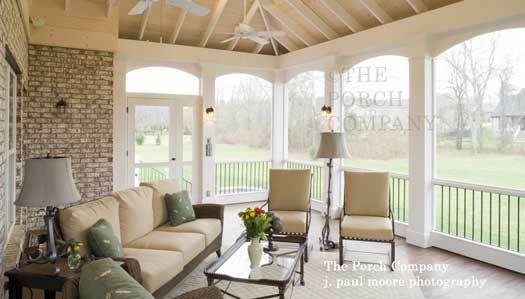 Your screened porch design should become an integral extension of your home rather than a "tacked-on" look. 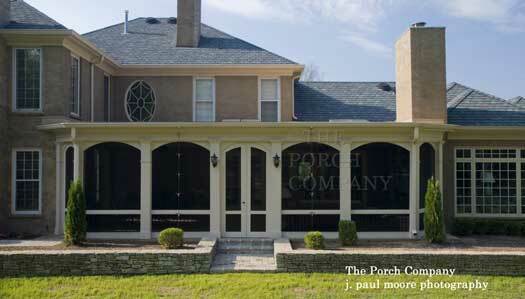 Photos below are compliments of The Porch Company, Nashville, Tennessee. For example, a screened porch off the kitchen designed for morning coffee and reading the paper needs to appear from both inside and out as an extension of the original kitchen. 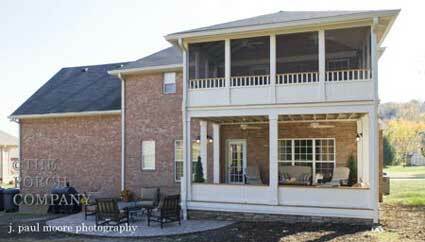 Likewise, a large second-story screen porch design should appear as an integral part of the second floor. 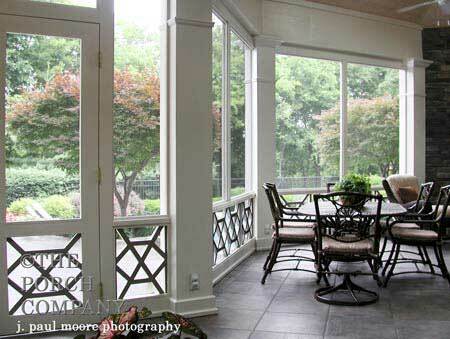 Consider the following exterior components when designing your new screened porch or modifying an existing one. Roofs can give your new outdoor room character and lots of charm. 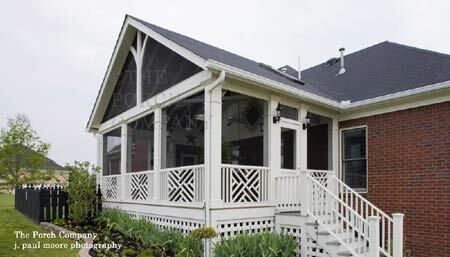 Roof lines can be the trickiest part of building a screen porch and should be one of the most important screen porch design considerations. Screen porch kits or enclosures usually use either gable or shed-type roofs which can be attached directly to your home. Shed vs. gable: Although a shed roof is usually the least expensive, a gable or hip roof may not only add more curb appeal but also allows for a cathedral ceiling which tends to make your room appear larger. Note how the roof lines tend to be consistent with the home's architecture in the photos below. In some cases, it may be very difficult to join one roof to another due to the rise and run (slope). The longer the roof the more rise (slope) it needs in order to shed water, ice, and snow. Depending on where you live, adjustments may be needed to meet local code requirements. Matching the roofing materials on both your home and screen porch roof is typical. However, you may want to consider other roofing options that have become very popular such as standing seam metal roofing. onto your porch and into your home. Hip roofs not only give you interior screen porch design options like exposed rafters but also make your interior space appear more spacious. screen porch with the home's architecture. Another flat roof design option - note how the width of the screen panels is basically the same as the width of the home's windows to create a more symmetrical look. 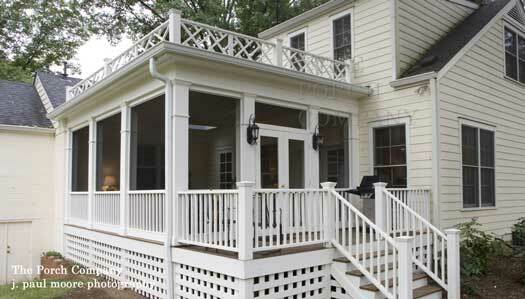 The photo above is an example of a fairly standard screen porch design (or screen porch kit) built on top of a deck. Using our ideas above, I'd add arch trim to the top of the screen frames and perhaps a skylight on each side of the gable roof as a start. What else might you do? See our entire roof design ideas section to learn more about designing, building, and covering. 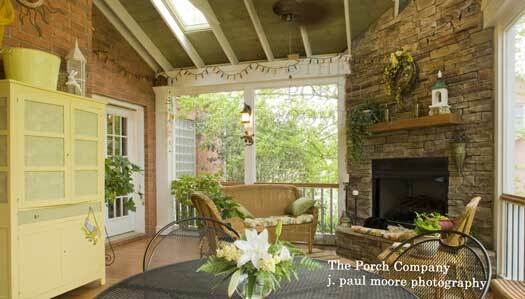 Attention to details can help blend your porch's style with that of your home. 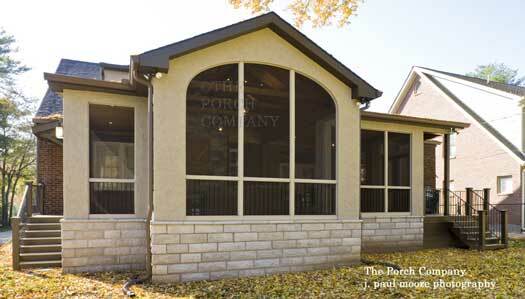 If you have a contemporary-style home, build a contemporary-style screen porch to complement your home. Another style may look out of place. 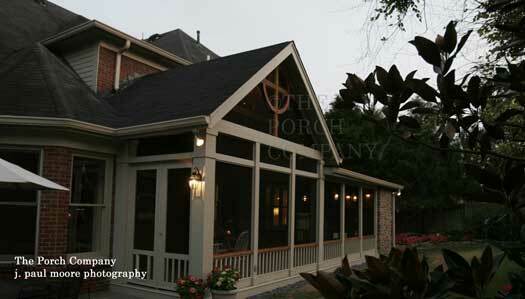 Use larger framing (columns and screen panel framing) especially on larger homes. Although this is a wood-framed porch on a brick home, the larger square columns give it a bolder look to match that of the house. Try to keep window framing and trim basically the same throughout. It doesn't have to match exactly but it should be close. Just as different window coverings can change the appearance of a room, trim and framing can change the appearance of your screened porch. The arched screen panels give this porch a softer appeal against the straight lines of this brick home. Imagine if the panels were rectangular - it would have a totally different visual affect. In contrast to the porch in the previous photo, the large rectangular screen panels mimic the home's windows making the screened enclosure an integral part of the home itself. 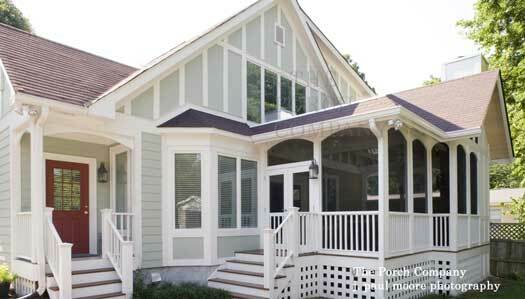 Integrate your home's trim into your screen porch design if possible. 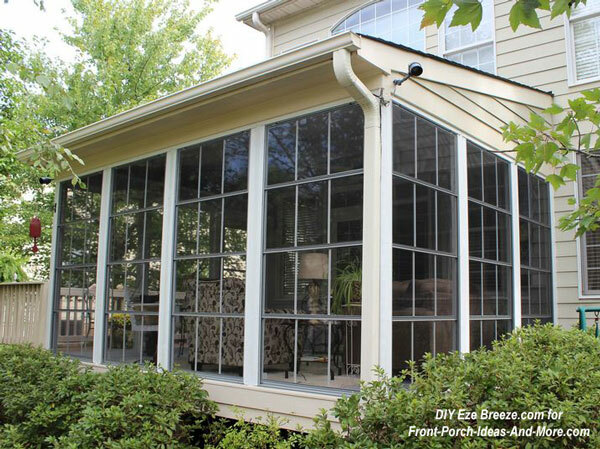 This is especially important if you are using screen porch kits or a screen porch enclosure. You can usually add trim easily to most screen enclosure kits. It need not be elaborate; just enough to mimic your home's trim will be sufficient to tie the two together. 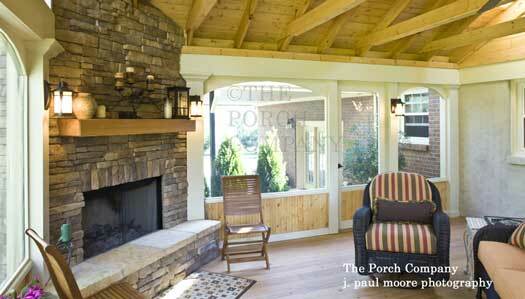 You can use other materials besides wood for your porch enclosure. 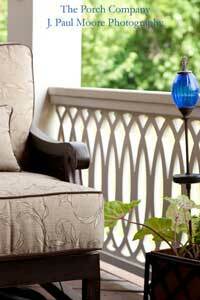 This stucco screen porch with complementary brick skirting is beautifully designed. What is immediately noticeable in this picture is the roof design which complements the home's roof style. 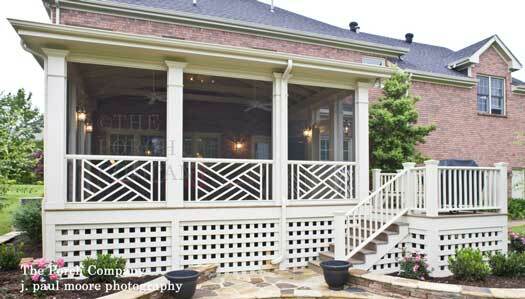 In addition, note the designer balustrade (railing) system; it adds lots of charm to this screened porch. Also, notice how the screening extends to the top of the gabled roof line adding additional air flow and light. They have also added skylights to the roof for more lighting. And finally, note the skirting that hides the porch's foundation. 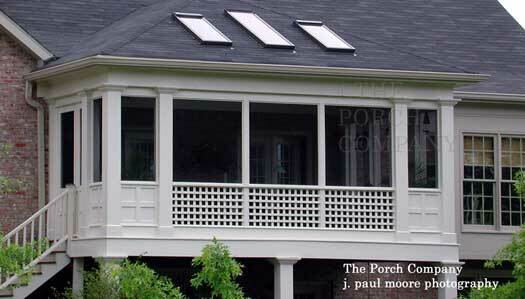 A beautiful screen porch's appeal can be ruined if you have an unsightly foundation or exposed supporting columns. 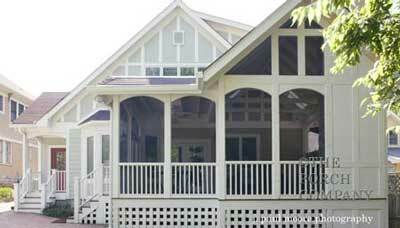 A screen porch is an extension of your home and therefore you will want to match or complement your home's foundation in addition to hiding supporting columns and the ground under your porch. 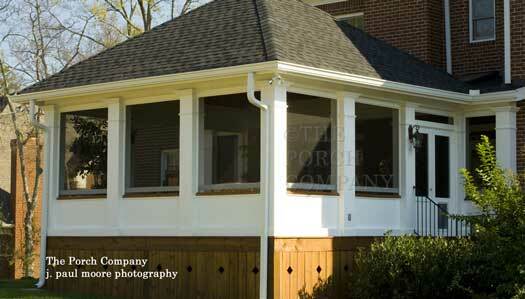 Because ventilation under the porch is so important, consider the type and appearance of your porch's skirting. The photos on this page show various styles of skirting. You can either use standard wooden lattice skirting or even create your own custom designed vinyl lattice. Mary and I really love the custom vinyl skirting from Acurio Latticeworks - they have amazing options for you. They even have vinyl lattice panels in black which are very popular and difficult to find. 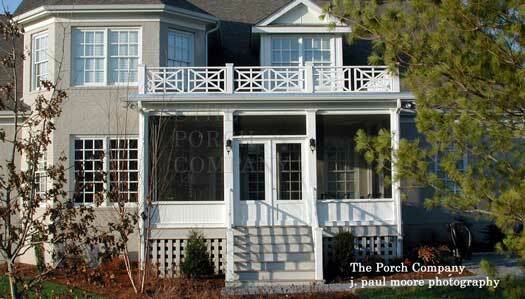 Porch railings are not only functional but can also be quite decorative. You may have noticed the railings in the photos on our page. If not, scroll around and see what you might have missed! Below are two examples to get you started. 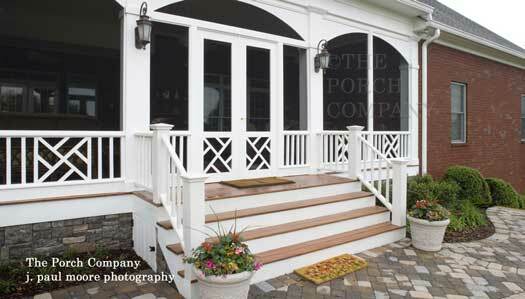 Be sure to see our entire railings section where we have a myriad of pictures showing many styles and ideas for selecting and installing the entire balustrade system. Consider using these screen porch windows to maximize your outdoor comfort.